Pep Ventosa’s work is focused on an exploration of the photographic image; finding new visual experiences in photography. His photographs have been exhibited in the U.S., Canada, Australia, Asia, and throughout Europe, and received honors from the Prix de la Photographie Paris, London International Creative Competition, American Icon Competition, International Color Awards, Photolucida’s Critical Mass, XVII Firart Penedès and other art and photography competitions. A Catalan, Ventosa was born in 1957 in Vilafranca del Penedès (Barcelona), Spain and currently lives near San Francisco. Multiple exposure images have increased in popularity over the past few years. You may have come across a technique called ‘in the round’ where a large number of images taken at intervals around a central focus are combined in layers to produce an image that is more akin to a drawing than a photograph. 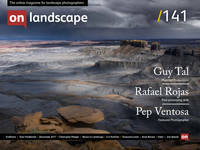 For this issue, we’re delighted to talk to Pep Ventosa, whose photographic compilations of trees, among other subjects, have inspired many others to try this technique. I grew up in a farmhouse in the Penedès wine country, south of Barcelona, attended school in the city of Barcelona and studied Tourism as a career. Franco ruled Spain under a fascist regime until I was 18 years old. They were scary times, with limited freedoms and a lot of repression. My reaction and shelter to that environment were through music and photography. I played drums in several bands, I guess as a form of personal resistance, and viewing photographs from the free world became like windows for me, something to aspire to and dream about. Through magazines and books, I discovered images of the hippie and social movements of the late 60s, amazing portraiture, beautiful pictures of remote exotic places and historic and archaeological sites, and photos of live concerts of bands which were impossible to attend in Spain at the time. Magazines like Life and National Geographic also served as an education for my eye, a great source of photojournalism and landscape photography. At the time, it was all a light in the darkness, an anchor to the world.